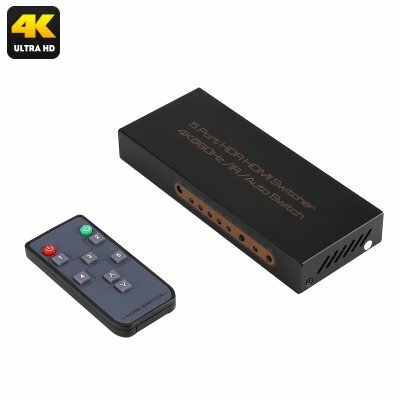 Successfully Added 5 To 1 HDMI Switch Box - 4K 3840x2160 Support, Dolby Digital, 60FPS, Remote Control to your Shopping Cart. With a matt black finish, this HDMI switch has a full metal body for better heat dissipation and features large air intakes at the sides to ensure there is no risk of overheating. At just 158 mm ( 6.25 inch) by 64 mm ( 2.5 inches) so it hardly takes up any space and it exceptionally portable should you need to use it away from home. The fanless design ensures this switch runs quietly so there will be no distractions from the entertainment at hand. This 5 port HDMI switch comes with 12 months warranty, brought to you by the leader in electronic devices as well as wholesale media boxes and home theater equipment..